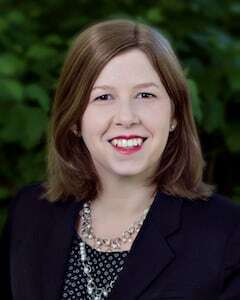 Kate Pomper Pruitt is a skilled and experienced member of the Firm concentrating her practice in Real Estate and Banking and Estate Planning and Administration, as well as litigation preparation. Her focus in real estate is in the purchase, sale, leasing, and financing of commercial real estate. In the process of handling real estate closings, Ms. Pruitt examines land titles, drafts contracts, and prepares closing documents. Lenders in commercial loan transactions rely on Ms. Pruitt’s experience in handling conventional loans, drafting loan documents, and coordinating loan documentation. In addition, Ms. Pruitt’s practice in Estate Planning and Administration includes many years of experience in matters of estate administration and working closely with clients to realize their estate planning goals. Prior to joining O’Malley, Miles, Nylen & Gilmore, P.A., Ms. Pruitt developed a strong background in federal and corporate antitrust investigations. Ms. Pruitt has extensive experience in document review, analysis and production for large-scale corporate matters, as well as attorney/client privilege review, preparation of privilege logs and quality control. Ms. Pruitt graduated from University of Maryland School of Law, and received her B.A. in Criminal Justice from University of Central Florida. While in law school, Ms. Pruitt worked with Chesapeake Habitat for Humanity in Baltimore in creating a real property acquisition program to assist the non-profit organization in obtaining vacant homes in Baltimore City and worked with Baltimore City housing agencies to facilitate the transfers of property. Ms. Pruitt interned at the office of the Federal Public Defender as well as the Maryland Division of Parole and Probation where she gained experience in federal court proceedings and hearings in Baltimore City District and Circuit Courts. She is admitted to practice in Maryland, the District of Columbia, and the U.S. District Court for the District of Maryland. Ms. Pruitt also has a great appreciation for classical Ballet and participated with the Baltimore Ballet Company as well as Goucher College’s production of Giselle and The Nutcracker. Assisted the firm’s litigation, securities, and antitrust practice groups with document review, analysis, and production for large-scale corporate matters. Reviewed documents for responsiveness to federal investigations and civil document requests. Assisted in attorney/client privilege review, preparation of privilege logs, quality control, and document production. Conducted research into industries subject to document requests and assisted with responses to subpoenas and interrogatories. Contract Attorney, Special Counsel, Inc., Washington, D.C.